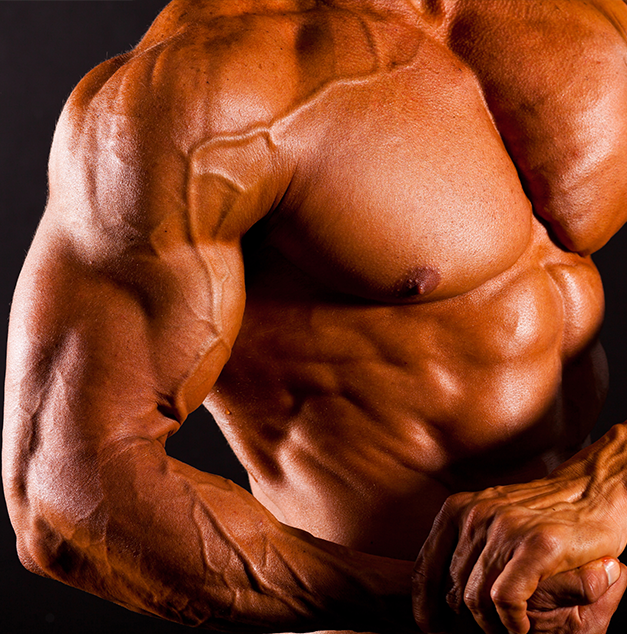 Hydroxy Ripped is Vital Strength’s equivalent of a fat loss protein. With their own GMP certified plant and having been in business for over 17 years, Vital Strength have developed a reputation as a sports nutrition company with great quality products. Hydroxy Ripped is a high protein product with a compliment of fat-burning nutrients they term ‘T3 Thermophase Fat Metbolisers’. Hydroxy Ripped contains 76% protein and 10.9% carbs, with fat content coming in at 4%. Possibly the best feature of Hydroxy Ripped is its quality protein content. Containing highly bioactive cross-flow microfiltered and ultrafiltered whey protein isolate followed by whey protein concentrate Hydroxy Ripped is packed with quality protein. High quality protein means a better anabolic response to training thus stimulating muscle protein synthesis; essential to healthy fat loss. Vital Strength also go to the trouble of analysing the amino acid profile of Hydroxy Ripped so the user can see the amount of each amino acid per 100g. Being able to calculate the percentage of leucine and BCAA’s provides additional insight into the quality of the protein. Hydroxy Ripped comes in at 7.8% leucine and 17.3% BCAAs – not bad for a fat-loss protein, but not up near the 10+% leucine content typical of top quality whey protein isolates. Vital Strength also go to the trouble of providing the user with a breakdown of the respective concentrations of the different whey protein microfractions present in Hydroxy Ripped. Providing information such as this is evidence that Vital Strength have a close working relationship with the companies they source their whey protein from. It also reinforces the quality of the whey protein in the product. If Vital Strength were sourcing their whey protein from some ‘no-name’ raw material supplier, they would not be able to provide such information. Crucial to the quality of every fat loss protein is its concentration of fat loss nutrients. Hydroxy Ripped fat loss nutrients are featured in a complex termed ‘T3 Thermophase Fat Metabolisers’. These nutrients include hydroxy citric acid, l-carnitine and chromium picolinate at 400mg, 70mg and 100mcg respectively. If one had to make a criticism of this product, it would have to be the levels of each of these fat-loss ingredients. Many competitor products contain 1000mg or more of both hydroxy citric acid and l-carnitine, which is significantly higher than the levels featured in Hydroxy Ripped. The other notable addition to Hydroxy Ripped is a full complement of vitamin and minerals. Inclusion of vitamins and minerals makes the product a more complete meal replacement for those intending to use as such. The product is also certified gluten-free which is a great bonus, given the increasing incidence and diagnosis of celiac disease. Vital Strength stipulate on their product labels and website that all their powdered products are manufactured under Good Manufacturing Practice (GMP) and Hazard Analysis and Critical Control Point (HACCP) procedures as well as meeting the Food Standards Australia and New Zealand (FSANZ) code. Unfortunately in the absence of such certifications, it’s very hard to assure that Australian-produced protein powdered actually contain what they say on the label. So while such certifications may add a couple of dollars to the overall cost of the product, in the author’s opinion, the extra cost is certainly worth it. Hydroxy Ripped received consistently good reviews from users concerning its taste and mixability. In closing, Hydroxy Ripped is a good quality fat loss protein with very high quality protein content. It’s only downfall is the potency of its fat-loss ingredients. 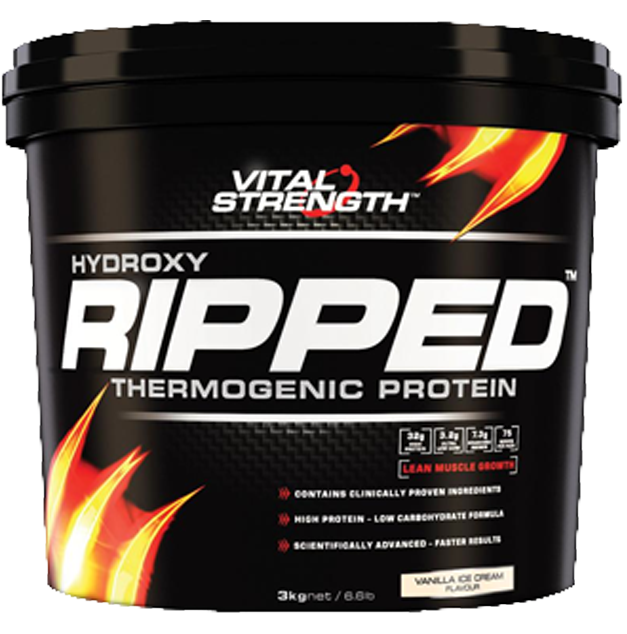 Hydroxy Ripped is a great choice if you're after a fat loss protein and like to support local Australian manufacturers such as Vital Strength.